I want to extend a big thank you to the kind folks affiliated with Center Veterinary Clinic in Mira Mesa (San Diego) for their fabric donations! In addition to their donated fabrics, I used scrap fabrics from Edith and Granny to create this Jean Ann Wright, Southern Comfort patterned quilt. I donated this quilt to the County of Ventura, Children & Family Services, via the Children’s Services Auxiliary of Ventura County, in April 2015. This quilt incorporates the last of Granny’s (non-scrap) lavender fabric. I know that Granny would be happy that this fabric has made its way into 4 quilts, including: Skypilots, Lavender Ladies and Sassy Squares. The green fabric was also some from Granny, while the poppy fabric was new. On March 24, we had the amazing experience of helping our sailing friends Richard and Audrey take their sailboat, Celebration, through the Panama Canal. I made this quilt for them, as both a birthday gift for Audrey and as a remembrance of this very special occasion. I decided that the name of their sailboat, Celebration, was the perfect name for the quilt too, as such a momentous occasion deserves a celebration! 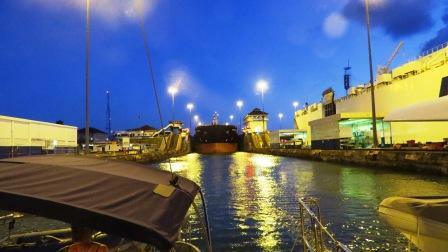 The picture here is of the Gatun Locks with a big cargo ship sharing the lock with us – the cargo ship is just coming into the lock, and when it eventually got itself “parked” in the lock, it was only about 50 feet behind us. 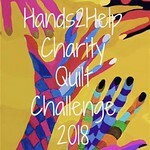 The quilt is a bricks and stepping stones design. Most of the fabrics were new, while one of the fabrics used in the stepping stones block was some left-over fabric from Granny.